The VGA Adapter lets you connect your ATIV Smart PC to external displays or projectors. 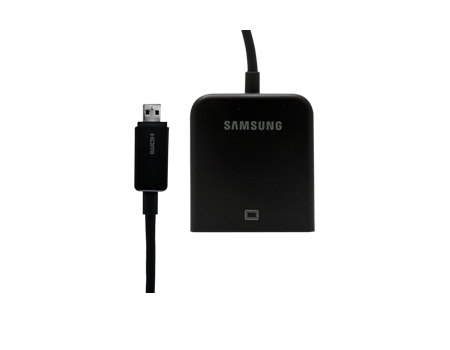 See more of what you're doing with the Samsung VGA Adapter. This adapter lets you connect your ATIV Smart PC to external displays or projectors. Use a larger screen as your main workspace or mirror a presentation to a display or projector at work. The VGA Adapter brings even more multitasking and productivity capabilities to your Samsung ATIV Smart PC. Easy to use plug and play. No driver installation required, no power needed. HDMI conversion converts HDMI signal to a VGA signal via the uHDMI to VGA adapter.